Well, hello there! I do exist. I've just been…well, you know. Staying remarkably busy with everything under the sun. The good part? Going from one child to two has been an easier transition in many ways. (I contribute much of this to the actually-rather-awesome four year age gap between the girls. More on this in a future post that I've been writing in my head for months…) And the possibly less-than-good but tolerable part? I just have felt it necessary to cut a few things from my to-dos. Namely, writing and many other internetty things. In any case, I thought I'd check in quickly and share a few good things from the past couple months! + I've been on a from-scratch kick lately, and here are a couple recipes I've tried that I totally recommend: Slow Cooker Black Beans via Cafe Johnsonia, Slow Cooker Refried Beans via Queen Bee Coupons. Is there anything else I should be making in my slow cooker that I've somehow been missing my entire adult life? Do tell. + Podcasts are kind of my jam. They're like a tiny (non)guilty pleasure that I look forward to indulging in every day at some point. (We don't have a dishwasher at the new place, so I do a fair amount of dish-cleaning these days. Totally tolerable with a good podcast keeping me company.) There are two I just started listening to that I adore: Sorta Awesome and The Popcast. Megan, the host of Sorta Awesome, is such a gem and I love that they cover everything from fluff to harder topics like anxiety—always making it feel like a conversation with your best friend. The Popcast can be a wee bit brash, but totally entertaining, and the hosts have actually make me more interested in pop culture (something that has, in recent years, given me hives). Give them a listen! You may start hand washing your dishes even though you have a dishwasher to give yourself more podcast time. Fair warning. 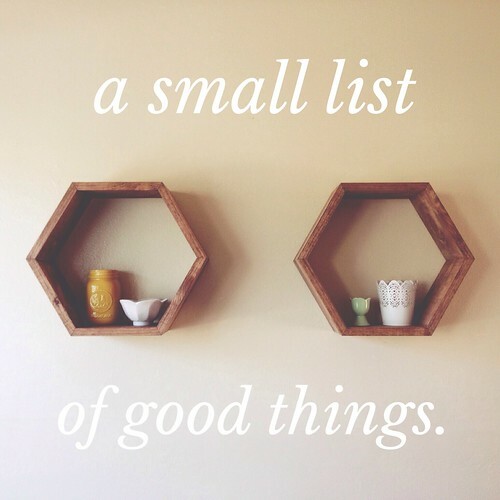 + I purchased hexagon shelves from this shop for my birthday, and they make me happy every time I look at them. I'm excited to get them all prettied with Christmas decorations. + This month, I have a hair appointment to get highlights for the first time in years. Years! I am so excited that I almost can't physically handle my emotions. So excited, you guys. + This song from The Sweeplings makes me all swoony. Fun fact: As a teenager, I did theatre with Cami Bradley for years, so it's wonderful and a little crazy (in the best way) to see what she's done with her amazing voice and overall adorableness. p.s. I forgot you don't do Facebook. ;) But it's a pretty cool group there. There is also a Voxer group, and some of the listeners have become friends of mine! Megan pops in from time to time, too. Those hexagon shelves are gorgeous. I do want to try out those podcasts (thanks for the recommendation). Still loving ePantry like I did on day 1. It's good to read from you, Kerri.